Borscht is a vegetable soup of Eastern European origin. It is traditionally cooked with beet and cabbage, as well as other minor vegetable ingredients, although certain cultures also include meat. 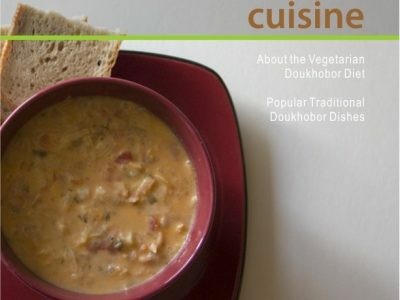 Doukhobor borscht is unique in the sense that it is strictly vegetarian, with an emphasis on cabbage and tomatoes. Unlike its beet red cousins, it is pale orange in colour, acquiring its colouration from the use of dairy cream. It is a thick hardy soup and can be a meal in itself, when accompanied with home-baked bread and cheddar cheese. It must be eaten hot, and even then, can be seasoned with black or red pepper. In fry pan pour 4 cups (1L) of canned tomatoes and mash. Add 1 tbsp (15 ml) butter and 1/4 cup (60 ml) of onions and simmer until thick. Place 1/4 cup (60 ml) of butter, 3/4 cup (180 ml) chopped onions, 1/2 cup (125 ml) finely grated carrots and 1/4 cup (60 ml) chopped green pepper into a frying pan and sautee until transparent – do not brown. In a separate frying pan, place 2 cups (500 ml) of shredded cabbage and 1/4 cup (60 ml) of butter and sautee until tender – do not brown. Boil 3 qts (3L) of water in a pot, add 1 tbsp salt, 1/2 cup (125 ml) chopped carrots, 4 medium potatoes halved, 1 beet, 1/4 cup (60 ml) chopped celery, and add 1/2 of the simmered tomatoes from step 1, continue to boil ingredients in pot until potatoes are tender. Remove potatoes and mash with 1 tbsp butter, 1/2 cup (125 ml) cream, 1/4 cup (60 ml) green pepper, 1/4 cup (60 ml) green onions, 1 tbsp dill, then set aside. To the pot in step 4, add 1 cup (250 ml) of diced potatoes, 3 cups (750 ml) shredded cabbage, 1/2 cup ( 125 ml) cream and bring to boil. Pour the mashed potatoes back to pot in step 4, bring to boil. Remove pot from heat and add remainder of simmered tomatoes from step 1, fried onions and carrots from step 2, the fried cabbage from step 3, add 1/2 cup (125 ml) green onions, 1/4 cup (60 ml) green pepper, and 1 tbsp dill. Discard the whole beet. Season to taste with black pepper. Let sit for a few minutes before serving to allow flavours to mix. Serve hot.